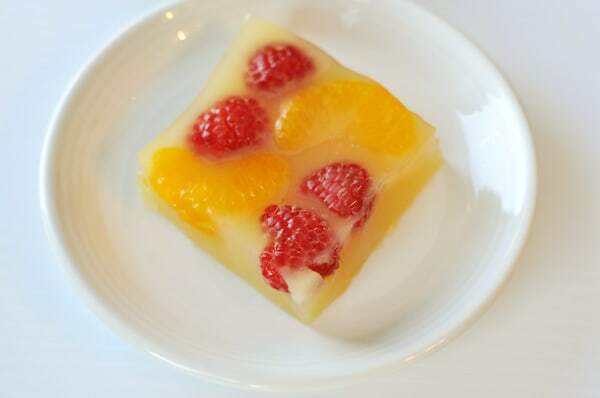 This simple gelatin (jello sounds better but it isn’t really, officially jello, if you know what I mean) completely exceeded my expectations. After spying the recipe in a Whole Foods cookbook, I was excited to give it a try but doubted it would live up to what I wanted it to be: a jello knockoff made with purer ingredients (notice, I didn’t say purEST ingredients, just purER…don’t want any hate mail over this, friends). Billed as a dessert, I bucked the cookbook suggestion and served it as a side dish, just like I would a normal jello salad…if I made jello, which I don’t. And yes, I know my children deserve therapy based on this fact but that’s not what we are discussing today. Thank goodness. Subtly fizzy and sparkly (thanks to the ginger ale), the sweetness of the orange juice and tart juiciness of the berries make for such a delicious concoction that we all were literally scraping the dish by the time dinner was over. Simple enough for a family dinner, it would also be elegant made in individual dessert/trifle cups and served at a more formal gathering. Perfect any way you look at it. Place the cold water in a small saucepan. Sprinkle the gelatin over the cold water and let it soften for five minutes then heat it gently on low heat, stirring slowly, until the gelatin dissolves. Add the 1/2 cup orange juice and the sugar. Warm gently until the sugar dissolves, stirring. Do not overheat. In a large bowl, place the remaining 1 1/2 cups orange juice with the ginger ale and whisk in the gelatin mixture. Pour the mixture into a 3-quart baking dish (about a 9X13-inch size). Gently stir in the fruit. Refrigerate the mixture until set, about 4-6 hours. Cut into squares and serve as a side dish or simple dessert. Fresh squeezed orange juice would work here, as well as bottled, but I would stay away from the overly sweetened concentrates. I prefer Simply Orange but you could play around with brands to suit your preference. I’ve been asked to bring a Jello salad to a big Thanksgiving dinner and I love the look of this one! Since fresh berries are expensive right now, I’m curious about what would happen if I use frozen/thawed. Do you think it would mess up the color & texture? I actually think that would work! It might turn the jello more pink-ish but that’s not a bad thing. This recipe was perfect! I substituted cream soda for most of the soda and added a teaspoon of vanilla. It was exactly as i hoped it would be. I’m saving this recipe! I grew up eating Jello…..probably weekly. for moderation, but also practical. use cream soup, we even have Spam a couple of times a year. This made a great addition to our Easter dinner! Yum. Thanks. Made this for company over the weekend and it was devoured. We loved the orange flavor and the pop of the raspberries and the ginger ale made it fun to eat. Will definitely make this again! My-oh-my is this ever tasty and refreshing! I made it this morning to test it out–success! I’m resisting going for thirds because soon enough I’d polish off the entire pan. What a perfect refreshing dessert for hot days. I’m planning to serve it in a couple weeks at a bbq and am hoping it will be a dessert my lactose-intolerant relative can digest. Huge thanks! I enjoyed reading all the comments on jello. I grew up eating it too. We had it almost every day it seems . . . either for dessert or with our meal. My mom even mixed up jello water and used to feed it to her babies. Looking back now it probably wasn’t a good idea because of all the sugar in it. That stuff would stay on their teeth all night – eeewww!! So regarding the comment about not adding fresh fruit to jello, I’m pretty sure that it is only fresh pineapple that you can’t use. That is because pineapple contains bromelain. Bromelain breaks down protein and gelatin is made of protein and other stuff, so therefore, the jello won’t set up. I believe gelatin is made by boiling the hooves, skins, bones, cartilage, connective tissue of cows, pigs, horses, etc. Sounds gross huh, but I guess it works!! Mel, it was super! So very light and fresh. Big hit with everyone and I was asked for the recipe 😉 Thanks again! Brittany – I’ve never doubled it, so I’m not sure but my guess is it should work especially if you split it into two separate dishes to set up. Sarah – I hope you like the end result and good tip on straining. I don’t remember any clumps but am glad you found a way around it! Made this before church this morning to be our Easter dinner dessert this afternoon. For some reason, cake just doesn’t sound good to me this year! Plus, none of us need the calories of leftover cake. 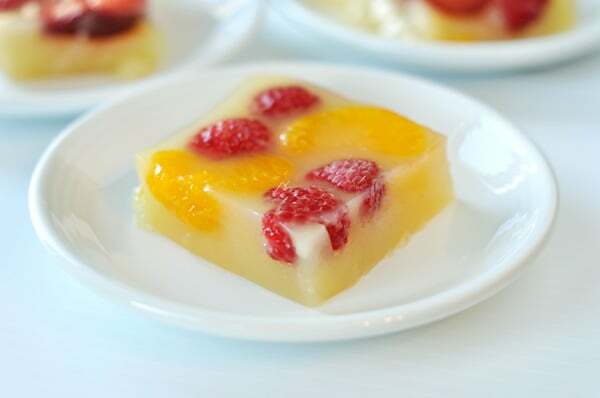 The only trouble I had was that there were a few clumps after I added the orange juice to the warm gelatin/water. They didn’t go away, so I strained the mixture as I poured it into individual dessert cups. I don’t know if this is normal or not (we NEVER have Jello, let alone homemade “Jello”), but I think the problem was solved. It looks beautiful and I can’t wait to eat mine! Thank you! Could you double this recipe and still have the gelatin set? I grew up eating jello, and seem to remember that on the box it says not to use fresh berries because it won’t set up. So it goes against the grain to add fresh berries, but I’m going to try it. Do you think it would work to double the recipe? And does all unflavored gelatin come in the same size packets? I bought Knox gelatin, the box that has 4 small envelopes of unflavored gelatin in it. I’m hoping that my 2 envelopes are the same size as the ones you used. 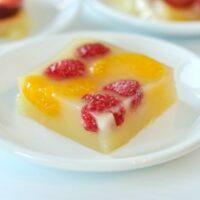 Kim – I never knew the tip about the fresh fruit, but this gelatin sets up, albeit a little softer than traditional jello. I believe all gelatin packets are the same size and I use Knox brand too, so you should be ok. As for doubling – it will probably work but you’ll definitely want to split it up into two dishes so that it sets up evenly. Good luck! I’m so glad to find out that I’m not the only jello-avoiding mom around! But this recipe is intriguing–I’ll try it soon. It’s like one that I make in the fall with apple cider, unflavored gelatin, chopped apples and walnuts. Thanks for the great idea! Right up my healthy alley! Homemade non- Jello jello! Why are some of the berries cut up? They are all added together, correct? Cat – the strawberries are cut up mostly because their larger size would be a little inconsistent in the jello. So to make the fruit mostly uniform – I sliced the strawberries. Yes, they are all added together. This sounds wonderful. My 3 boys will also be in therapy with your 4. Just the other day my 4 year old had jello at preschool and wanted me to make it at home. I said no. Thank you for allowing me to please him, especially since he is a very picky eater. I found your site about a month ago and I LOVE it. I have made more recipes from your site in the last month than I can count on both hands. You are my go-to site for recipes now. I believe I may be addicted to your site. Oh well. I guess I can always go to therapy with my non-jello eating boys. Thanks so much for all you do. I can not believe people send you hate mail. Some people can be so mean. Please do not stop your blog because of it. I WILL need therapy then. I’m so sad that you get hatemail. I love everything about your site (most especially the recipes of course). This is my #1 site when I am menu planning or just searching for dinner. I have recommended it to others and they love it too. Just yesterday I was IMing with my sis-in-law and she was planning to make your butter chicken recipe and I was planning on your toasted Orzo recipe. Thank you for giving us recipes that make me want to cook and that my family will eat! I think my daughter will be there in therapy with your boys. I never make Jello for her either. I tried once but she didn’t like it and still doesn’t to this day. Maybe I should try this out and see if she changes her mind. Thanks as always for the really great receipes! I never heard of Jell-o for sore throat therapy, but my mother and grandmother think you should drink “Jell-o water” (Jell-o dissolved into hot water) when you have diarrhea. I always ignore that “sage advice,” not only because it sounds like it would be awful to drink, but I don’t know how consuming that much sugar could help a diarrhea problem. And I would also like to know more about your “hate mail.” Who writes you hate mail and what are they hating about? I think you should post some of your best hate mail for your faithful readers’ enjoyment. This looks like the perfect, cool and refreshing summer dessert. Definitely saving this for the hot days in Texas this summer! I have never been a big fan of Jello salad (maybe too many potluck lunches when I was a kid?). So I am curious how this homemade version tastes compared to the 1960 classic. Scoggdog, I thought for sure my family was the only one who was crazy enough to use that sore throat remedy! Ha ha ha! 🙂 That’s what we ALWAYS got when we were little and had a sore throat. I’ve been known to use it as an adult, too (shhh – don’t tell). Mel, this looks like a terrific recipe – thank you so much for sharing! You have impeccable taste, because so far, you have yet to post a recipe that my family hasn’t absolutely loved – every single time! I cannot wait to find time to try the bagels, and I think this gelatin recipe will be making an appearance at our Easter dinner! I love that you posted a creative, homemade jello recipe. I don’t usually eat jello, because well the thought of what’s in it grosses me out. I have a grandfather though who LOVES jello (I think it takes him back to when he was you younger), his 84 birthday is coming up and I will be making this just for him. Thank you! P.S. Don’t worry too much about your boys needing jello therapy, growing up I only got jello if I had a sore throat, it was served warm (we drank it before it set up) and I turned out just fine! this looks delicious!! I may have to make this as an easter dessert surprise! It looks so light and refreshing! Can I make this with diet gingerale? I can’t have sugar. Catherine – yes, I think diet gingerale would work just as well. I’m with Janssen, do you really get hate mail? Cuz I can’t imagine that anyone would have any real reasons to complain about anything you share with us – your entire site is amazing! And this gelatin 🙂 looks awesome and so easy! Hopefully I can add this to our Easter menu! Do you really get hate mail? Sounds really nice. I grew up eating the actual jello. I have a feeling yours tasted better. I make Jell-O about once every other year! This looks good though! This looks really refreshing! It would be a great addition to my Easter dinner. I have that Whole Foods cookbook on my shelf, and haven’t looked at it in years. I am going to have to re-visit it! Thanks, Melanie!